Since Bretton Woods and the creation of post WWII Monetary structure, US obligations were considered risk free and its debt instruments rated as AAA. Global risk and spreads have traditionally been priced off this foundation. A crippled dollar and US debt worries has the potential to trigger a global credit melt down. The 2008 financial crisis with Bear Stearns and Lehman gave us just an inkling of the magnitude of the problem. This is forcing a game of Risk Free Counterfeiting to now be played out. It will end, and end badly. However, at the present time it is considered the only politically palatable solution. The need for US dollars has fallen from being 71.2% of foreign reserve currency holdings in 1999 to 58.0% in 2011. The need to hold dollars for oil purchases is being challenged by the BRIC countries through on-going trade alliances. Alliances that are counter to the Petro$$ foundation. China and a growing list of nations are shifting currency reserve holdings from US dollars to Gold. China is now accumulating minimally 1,000 tons per years and will soon be in a position to partially Gold back the Remimbi. Debt around the world has traditionally been structured in US dollars. A collapsing US dollar erodes the collateral value of the debt which is often used as collateral in the Rehypothecation process. This exposes the world to a collateral contagion of massive proportions. 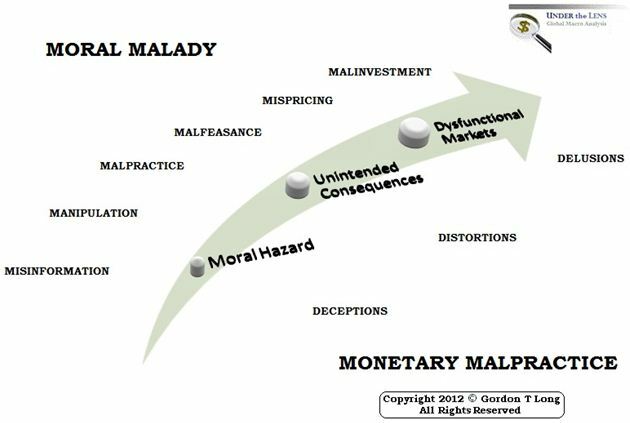 Monetary Malpractice has its moral hazard and unintended consequences has led to significant levels of global mispricing and malinvestment. Risk is no longer being priced correctly as the Fed Valuation Model has broken down due to sustained, negative real interest rates. This has forced the Bank of International Settlements (BIS) to facilitate what can only be called a Currency Cartel to alleviate the daunting global pressures which the eroding need for US dollars is causing. As the Central Bankers' Central Bank, the BIS exercises control over the settlement of the balance of payments and the problems stemming from growing global imbalances. 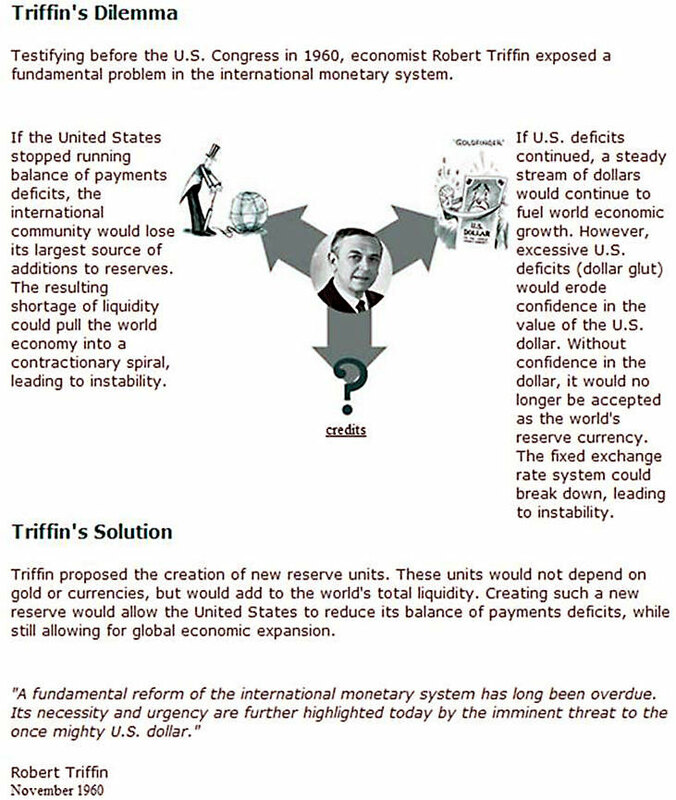 Effectively, what appears to have emerged is a forced alliance between fiat currency based regimes, to protect themselves and sustain the faulty system that emerged from post WWII Bretton Woods. When the US jettisoned its obligations, and in August of 1971 took itself off the gold standard, the US effectively defaulted on its obligations as the world reserve currency. Since then it has been primarily the 'good faith and credit' of the US, that has sustained an acknowledged failed and broken system. The current US Fiscal Cliff machinations only bring to the fore the seriousness of any longer considering the US as "Risk Free" and being a realist foundation for a sound and sustainable global currency reserve. As true as this is, it is not going to change as long as the status quo can be protected, and protected it must be! Similar to the OPEC Oil Cartel protecting the price of 'black' gold, we now have a Currency Cartel protecting the US dollar, and more specifically, the fiat currency system which they all are inextricably tied to. It is the basis for their collusion. The Currency Cartel is effectively Colluding to Counterfeit "Risk Free". "To supply the world's risk-free asset, the center country (US) must run a current account deficit and in doing so become ever more indebted to foreigners, until the risk-free asset that it issues ceases to be risk free. Precisely because the world is happy to have a dependable asset to hold as a store of value, it will buy so much of that asset that its issuer will become unsustainably burdened." We have reached the point where the Currency Cartel and the $67T Shadow Banking System (monitored, but not supervised by the Financial Stability Board (FSB)) is the only thing standing between us and a violent Fiat Currency Collapse. There is a structural dynamic in play known as the Triffin dilemma or paradox. The basic idea is that when one nation's fiat currency is used as the world's reserve currency, the needs of the global trading community are different from the needs of domestic policy makers. This dilemma was first identified by Belgian-American economist Robert Triffin in the 1960s, who pointed out that the country whose currency foreign nations wish to hold (the global reserve currency) must be willing to supply the world with an extra supply of its currency to fulfill world demand for this 'reserve' currency (foreign exchange reserves) and thus cause a trade deficit.